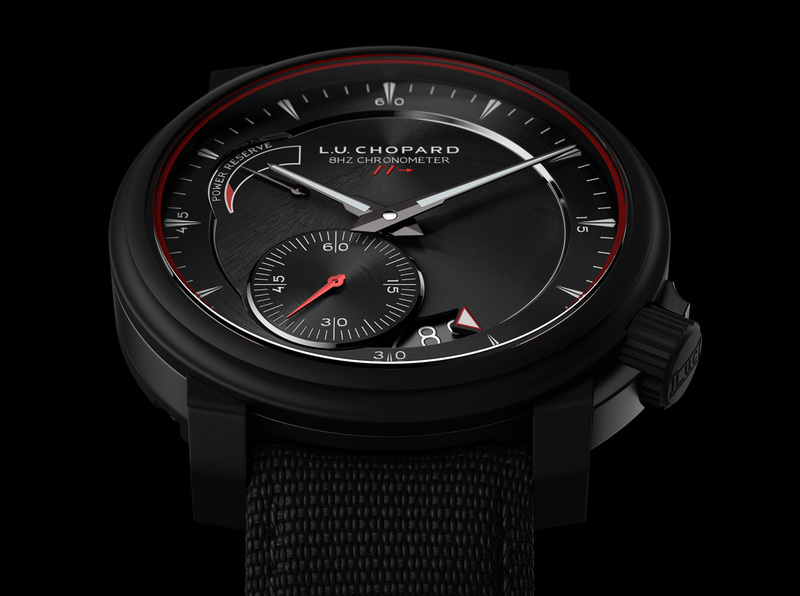 Chopard has given its ultra-high frequency movement a striking, modern look, with a black ceramic case and red accents, available as the 250-piece limited edition L.U.C 8HF Power Control. 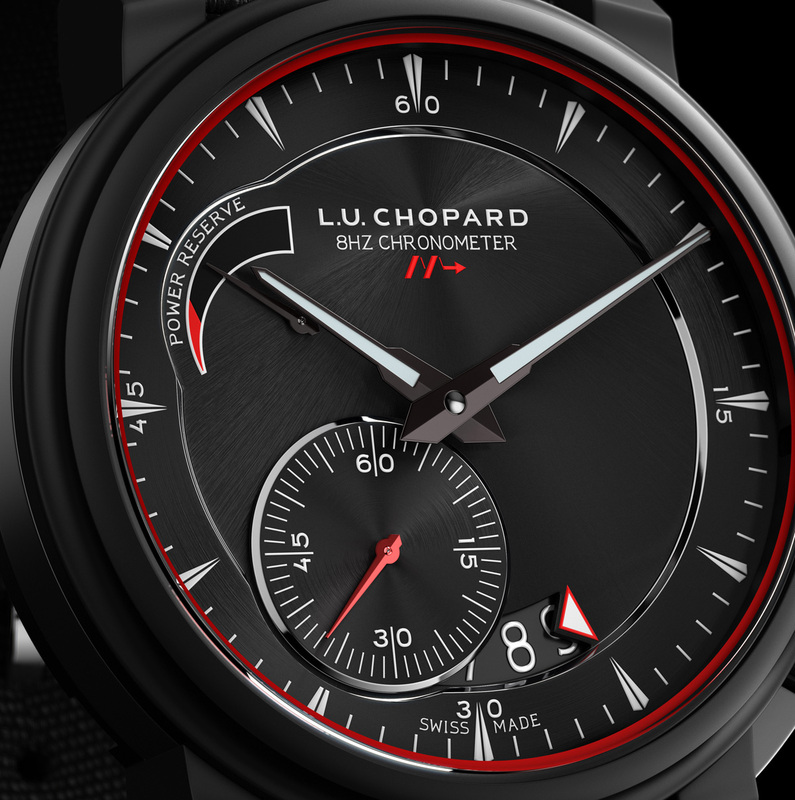 Chopard was amongst the first brands to create a serially produced, ultra-high beat movement when it presented the L.U.C 8HF back in 2012. Running at 8 Hz or 57,600 beats per hour (bph), the L.U.C Calibre 01.09-L movement returns at Baselworld 2014, inside the L.U.C 8HF Power Control. The high frequency of the Calibre 01.09-L – double the 28,800 bph of most conventional movements – helps it keep better time by increasing the inertia of the balance, making it more stable and less prone to deviations caused by external factors like impacts and shock. Despite the high frequency of the movement, it still manages a respectable 60 hour power reserve. 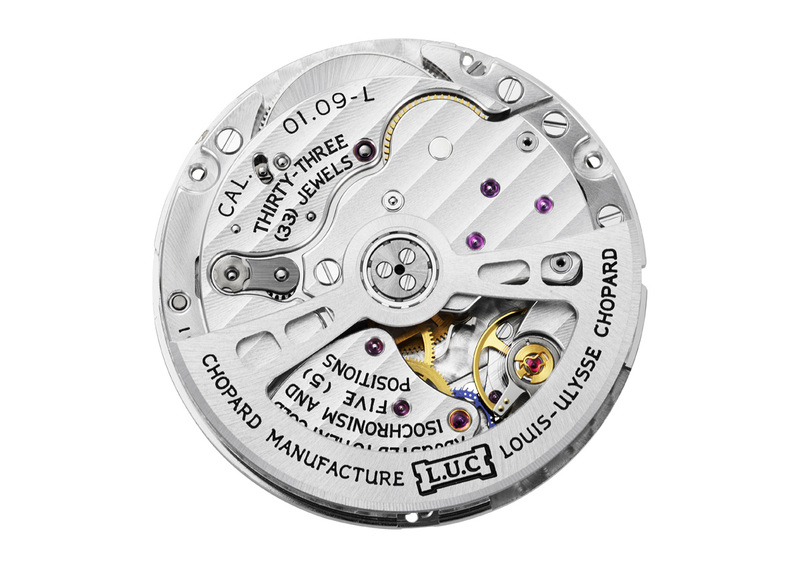 Notably, the silicon parts used in the Calibre 01.09-L, namely the impulse pin, lever, escape wheel, are interchangeable with the same components in other Choprad L.U.C movements. 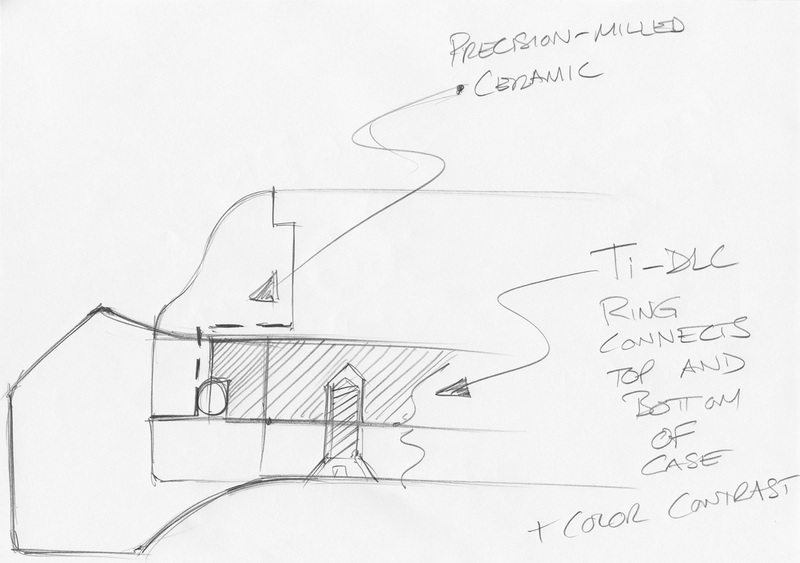 That means these silicon components will surely make their way into other calibres in the not too distant future. 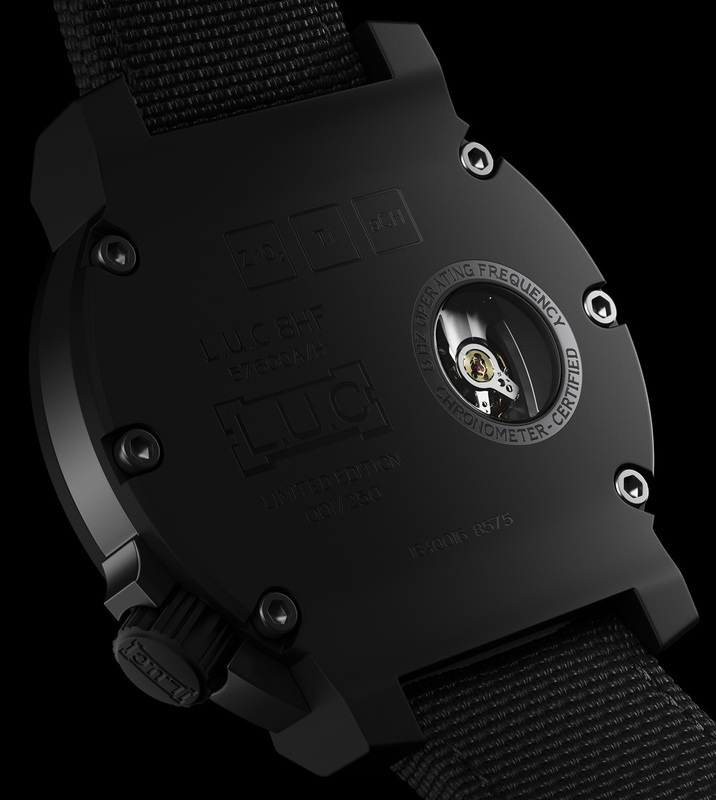 The L.U.C 8HF Power Control has a 42 mm matte black ceramic case and crown. The bezel is also ceramic, with a black titanium ring in between the bezel and case. A sapphire porthole in the back exposes the balance wheel beating at a frenetic 57,600 bph. Finished with a sunburst brushing, the dial is black with red accents. The date window is at six, and the power reserve at 10. Though Chopard’s track record in watch aesthetics is inconsistent, the Power Control is surprisingly attractive and coherently designed. The L.U.C 8HF Power Control is limited to 250 pieces with a retail price of 26,530 Singapore dollars. That includes 7% tax and is equivalent to US$21,000.